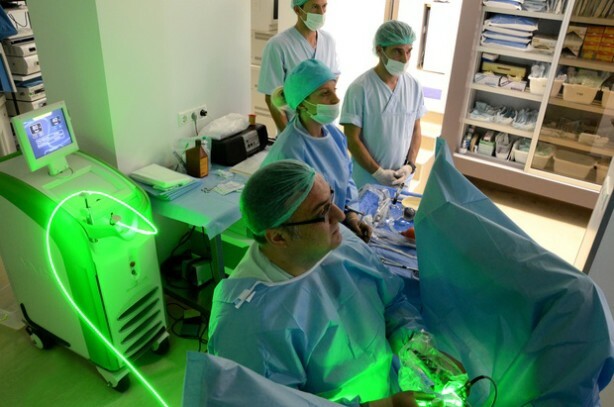 Hill Clinic has the only one Green laser in Bulgaria. The enlarged prostate or the benign prostatic hyperplasia is one of the most widely spread illnesses in man. Symptoms of this illness are discovered in above 40% of men that are above 50 years old. First symptoms are: frequent urination, the stream of urine decreases and as a result the bladder is filled with varying quantities of urine that in extreme situations can be up to 1.5 – 2 liters, often the result is incontinence of the urine. A treatment with drugs and medicines is provided in the early stages of the illness. If it does not lead to any relief it comes up to a operation: adenomectomy, or TURP. This operation causes a number of complications and discomfort for the patient – catheterizing and also risk of some side effects as impotence and incontinence of the urine. Today, the modern medicine has the solution of the problem – PVP (photoselective vaporization of the prostate) through the specially developed system Green laser. The treatment with Green laser is minimum invasive and is for sure the alternative of the surgical operation of the prostate. PVP is a final procedure – i.e. it eliminates the increased prostate, it takes about 60 minutes and there are no serious side effects. The operation is done with a special laser applicator “Greenlight”. The light impulses of the Green laser are directed towards the tissue of the prostate gland and effectively vaporise and eliminate the adenoma. The advantages of the PVP compared to TURP are the minimum risk for complications and side effects afters the treatment. Decrease of the symptoms of the illness and improvement are observed as early as the next day. There is a normal urination and the bladder is empty. A significant advantage is the almost absolute absence of bleeding – it can be done even on patients that are taking blood diluting drugs because of a cardiovascular disease. The rest of the procedures for elimination of enlarged prostate are connected with blood loss and are impossible to carry out for that group of patients. The very little blood loss during the procedure with Green laser significantly reduces the time for the operation and anaesthesia, because no time is spend for coagulation of the bleeding vessels as it takes in the classic operation of the prostate. Usually the catheter is removed on the next day and the patients leave the hospital. None of the existing methods has such results in the treatment of the benign prostatic hyperplasia as well as the almost absence of complications and side effects. The continuous monitoring of the patients that were treated with PVP shows that in most of the cases repetition of the symptoms was not observed for at least 5 years. The side effects after surgery if any are minimal and are only temporary. Patients are back to their normal activities after few days and the total recovery takes few weeks. In rare cases there can be blood in the urine but this is not dangerous and does not require medical intervention. PVP is the last achievement of the modern medicine in treatment of benign prostatic hyperplasia and is offered in the leading urology clinics worldwide. My urinary problems are over! After the Green laser procedure I throw out the catheter!